The Wheel of Fortune Key is one of the reasons I so love Tarot! Fraught with symbols from several world beliefs, this Key tells us that the Universe is always in motion and is always watching over us and guiding us, if we just pay attention! The wheel in the center of the key has three concentric circles. 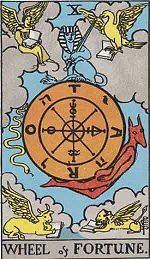 The inner circle is our creative force, the middle circle represents our formative power, and the outside circle represents the outside world (these symbols also appear in The Hierophant’s crown). In the center of the inner circle rests an eight-spoke wheel, representing universal radiant energy. Between the middle and outer circle are the letters T A R O T in both English and Hebrew. On the left of The Wheel is the Egyptian god Typhon, represented here by the serpent. He represents life-force descending into manifestation. This is the same life-force being drawn down by The Magician in Key 1. On the right of The Wheel is the Egyptian god Hermes-Anubis, the jackal-headed god representing intellligence always aspiring to ascend. At the top of The Wheel sits the Sphinx, representing wisdom and equilibrium. The Sphinx denotes that we are not governed by fate, but always have the power to change our lives. Among the serpent, the jackal and the Sphinx, the wheel is turned from darkness to light, from night to day, from evil to good, from negative to positive. Symbols of the fixed signs of the zodiac rest in the four corners of the Key. The angel/man represents Aquarius, the eagle represents Scorpio, the lion represents Leo and the bull, Taurus. Together, the numerological symbols of these four add up to 26, the number of Jehovah, IHVH, in Hebraic thought. The Wheel of Fortune Key symbolizes the notion that we are all a part of a universal, constantly unfolding plan. There is orderliness and fluidity in the workings of the universe and in our lives. We always have choice. Those who study this Key also should learn about mandalas and labyrinths as tools for growth. Finally, The Wheel of Fortune reminds us that whatever we send forth always comes back to us!